Stars are not alive, and yet we speak of their origins and ends as “birth and death.” It’s a convenient, if fanciful, way of describing the ultimately ill-fated relationship between matter and energy that is a star. Radio astronomy has helped astronomers explore the life stories of stars, and here is what we have learned so far. A dwarf star’s core can fuse hydrogen for billions of years before its lower atmosphere begins to boil. It swells into a red giant, then keeps expanding until its outer gases blow away. Left behind it a hot core that can no longer fuse, called a white dwarf. The color of a star is an indicator of its temperature. The cooler stars are brown to dark red, barely warmed enough to glow, like the cooling embers in a fire. The hotter stars are blindingly blue-white, like the extreme flame of a welder’s torch. The nearest star we can study is our Sun. It is a very average star, which means that galaxies in the Universe contain smaller and larger, brighter and dimmer, and hotter and cooler stars than our Sun. The Sun and the bulk of the stars in the Universe are called dwarf stars. These stars range in size from brown dwarfs, which grow up to around 8% of the mass of our Sun, to yellow dwarfs, which we find up to about 120% of the mass of our Sun. The rarer giant stars can be up to 100 times the mass of our Sun! Brown dwarfs are barely stars, as they only shine for about ten million years while their cores crush the rare element deuterium into helium. After their deuterium is gone, brown dwarfs glow in the invisible light of infrared waves for billions of years, their insides churned and warmed by the bubbling of escaping heat as they slowly collapse under their weight. Brown dwarf stars will eventually cool down and become dark balls of cold gas. Despite being invisible to optical telescopes, over 1,600 brown dwarfs have been found so far. Astronomers have detected clouds and weather on brown dwarfs, much like the conditions found on gas giant planets. To our surprise, however, brown dwarfs are bright in X-rays and give off powerful radio wave flares, making them also appear like lightweight pulsars! Brown dwarfs are a fascinating link between gas giant planets (like Jupiter and Saturn in our own Solar System) and stars, and their continued study helps us better understand the formation of both throughout our Galaxy and beyond. Giant stars go through their fuel in hundreds of millions of years, fusing to helium, carbon, through to iron. Each new fusion stage swells the star into a bigger and bigger red supergiant. The iron core implodes into a neutron star, and its energy explodes the outer gases in a supernova. Red, orange, and yellow dwarf stars can keep up the tug-of-war — gravity squeezing inward against a fusing core shining outward — for billions of years. Their insides tumble, creating powerful magnetic fields around them. Magnetic fields are wonderful radio broadcasters, because particles trapped in magnetic fields emit radio waves as spiral about. Radio telescopes have helped us learn that dwarf stars have tremendously active surfaces inundated with sunspots and flares. These eruptions feed their magnetically-charged outer atmospheres with a constant stream of particles. Our Sun’s surface is not nearly as active as its smaller cousins’, and its magnetic field barely energizes its outer atmosphere enough to give off radio waves we can detect. What makes our Sun so different? Could the Sun’s surface activity change in our lifetimes? What effect would such a change have on Earth? Current studies with our dedicated 45-foot solar radio telescope in Green Bank, plus observations with the VLA and ALMA, aim to learn more about our Sun’s activity and how we might predict its future behavior as it ages. All dwarf stars do eventually change, but it takes them billions of years to do so. When a dwarf star’s core finally uses up the hydrogen fuel it needs to shine outward, its outer atmosphere begins to collapse under its own weight. As it compresses onto the hot core, a thin layer of the squashed hydrogen fuses into helium. The fusion pumps energy toward the surface, boiling the star’s atmosphere. The boiling gas cools off as it expands, and the bloating star takes on a redder color. Swelling to thousands of times its original size, this expanding dwarf star becomes a red giant. When our Sun becomes a red giant, it will swell to engulf the Earth! During the two billion years of its red giant phase, its hot core becomes coated in the ashes of helium from the layer burning above it. For stars the mass of the Sun or more, this burden increases the core’s temperature until its helium is hot enough to fuse into carbon. 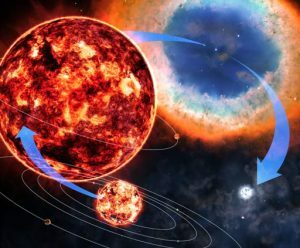 A carbon-burning red giant star gives off nearly 10 times the energy it did as a dwarf star. In only a few hundred million years, the red giant burns through its helium and collapses again. This fuses a layer of helium above the hotter carbon core, which creates enough heat to boil the outer gases of the star so fiercely so as to expand beyond its ability to keep hold of itself. However, the dwarf star does not have enough mass to crush the carbon core into heavier elements, and the core stops fusing. A hot core of carbon atoms holds together, thanks to gravity, but resists crushing itself, thanks to the pressure of the spaces inside the atoms. If you’ve ever tried to squeeze a balloon, that’s a similar kind of pressure, but on a giant scale. We call this delicate balancing act a white dwarf. The expanding outer gases eventually fly away, leaving the exposed white dwarf to gradually cool into a black dwarf. If a white dwarf is not alone, however, and is in a close pairing with another star, chances are high that this is not the end of the white dwarf’s story, and radio telescopes will spot the continuing tale. A white dwarf is stable as long as it is no more than 1.4 times the mass of our Sun, a value called the Chandrasekhar limit. However, as a white dwarf’s companion star goes through its giant phase, it will likely swell enough to spill hydrogen on to the white dwarf. This will ruin the white dwarf’s stability. If it gains enough gas to tip over the balance mass, the white dwarf will detonate, leaving behind only an ever-expanding fireworks display of exploding star matter. Giant stars range from about 3 times the mass of our Sun up to the hypergiants, which can be a 100 times the Sun’s mass. The core of a giant star is under extreme and constant pressure from the weight of itself. Its atoms fuse furiously to give off the huge amounts of energy needed to buoy its heavy burden of gas. As a result, giants shine fiercely, blue- and white-hot, and streaming out particles in huge winds. These particles give off radio waves, and radio telescopes have picked up the signals of giant stars throughout our Galaxy. A giant star’s extreme balancing act does not last long, however. Its core fuses its available hydrogen into helium in about 100,000 years. Then, it needs only a couple of hundred years to compress and make carbon, then oxygen, and silicon before building iron deep inside its core. Red supergiants shudder in brightness as their balancing act falters between burning phases. Yet, they continue to stream out particles as their cores furiously fuse to heavier and heavier elements, and our radio telescopes see eruptions from their surfaces as they churn through their fuel. The clumpy environments surrounding some of these powerful stars beam like radio lighthouses as they are hit with the outpouring energy. Eventually, iron becomes a parasite inside the core of a supergiant star, because instead of releasing energy when it fuses into heavier elements, iron needs energy. A giant star’s balancing act requires energy production from the core that the fusing of iron cannot provide. With nothing to stop it, the weight of its atmosphere finally crashes into the non-fusing iron core, squeezing the spaces out of its atoms. Electrons smash into protons, and a stupendous amount of energy is released as they form neutrons. The sudden outpouring of energy launches the gases of the star in an everlasting expansion out into space. For days, the explosion shines brighter than all the stars in a galaxy combined. It is called a supernova. As the gases speed away, they do so according to the size of their atoms. Radio telescopes see the signals of elements the giant star made over its short lifetime, and watch as its exploding gases shock nearby clouds in their wake, sparking a new generation of stars and planets to form. The study of supernovae is important in areas beyond the study of stellar evolution. The light curves of supernovae from distant galaxies can be use to determine distances to the far reaches of the Universe. The compressed sphere of neutrons left behind is known as a neutron star. Neutron stars are extremely dense – while they are only a couple of miles across, but they contain more mass than our entire Sun. 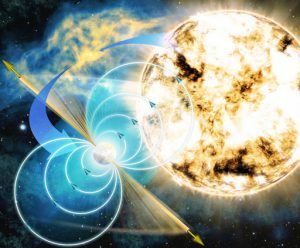 Radio telescopes discover and monitor thousands of rapidly spinning neutron stars known as pulsars. Pulsars tell us as much about giant star death as they do about the behavior of the atomic particles crushed inside them. We also use the precise beats of pulsars as clocks and buoys to measure events and structures in space. Particularly massive stars, over eight times the mass of our Sun, crush the atoms in their cores past neutron stars to a mind-boggling state of collapsed matter that is incredibly difficult to imagine or explain. The collapsing object is so dense that the pull of gravity near its surface is stronger than the speed of light. If light cannot shine off of its surface, we cannot see it directly, and we call such a corpse a stellar black hole. As matter interacts with the strong magnetic and gravitational fields surrounding stellar black holes, it gives off radio waves. With radio telescopes, we have measured the rotations, weights, ages, temperatures, and locations of thousands of these exotic star corpses in our Galaxy and in other galaxies across the Universe. 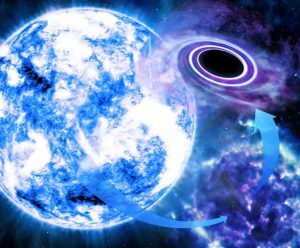 A supermassive black hole at the center of our galaxy has recently been observed to have matter falling in at high speed. Radio telescope can periodically observe this matter to determine properties about the black hole and its surrounding environment.